Quality drinking water is appreciated worldwide and only by applying the best treatment technologies will it satisfy all relevant standards and regulations. In the UK, Bristol Water takes pride is supplying its customers with the highest quality drinking water coming from two treatment plants close to the Severn Estuary on the north side of Bristol. With a capacity of 60 mega litres per day, the smaller of the two plants has demonstrated itself as a valuable proving ground for the use of Partech Instruments’ sludge blanket detector 8200 Series Monitor and Soli-Tech 20. Such has been the success of the 8200/Soli-Tech 20, Bristol Water is now installing these instruments for the same application at the second much larger treatment plant. Prior to installing the Partech detectors at the smaller plant, the traditional approach to measuring sludge blanket levels in the clarifiers was by weight activation. Each of the clarifiers consisted of an inverted cone into which the sludge settled and once a certain weight had been reached, a bleed valve under the cone automatically opened and the sludge was evacuated. However, after 15 years’ service the weighing systems were starting to become unreliable, the result being that on occasions the sludge blanket overflowed into the outlet channels and entered the treatment works as dirty water. In order to counteract the problems of overflowing sludge, the bleed valves were left partially open. In 2003 Bristol Water took a decision to review alternative approaches to monitoring sludge blanket levels in the clarifiers and automatically activating the discharge valves in the cones. The solution eventually selected for an extended evaluation period, was from Partech Instruments and this consisted of 8200 Series Monitors and Soli-Tech 20 sensors. Bristol Water’s plant engineer at the works takes up the story: “For the trials we opted for two Soli-Tech 20 sensors for each clarifier, one suspended in the cone and the other above the cone but below the surface of the water. This arrangement with the second sensor was implemented merely as a back up in the unlikely event of the lower sensor failing. Because of the water flow the, sludge blanket tends to rise and fall in the tank resulting in a certain amount of fine sludge rising up the clarifier. Partech’s Soli-Tech 20 sensor is a compact, rugged instrument that uses the infrared absorption principle for detecting both high and low density solids. Suspended at a fixed point below the water surface, it is attached by cable to the 8200 Monitor, from which it draws its power supply. The 8200 Monitor provides a reliable method of detecting the sludge blanket in settlement tanks and clarifiers. Suitable for mounting outdoors on the bridge of settlement tanks, the enclosure is IP65 rated so an outer enclosure is not required. Provision has to be made for transmission of the output signal to the control system and this is normally possible via spare slip rings. Where this is not possible a radio telemetry option is available, allowing transmission directly to the control system without the need for installation of cables. The 8200 Monitor operates with two sensors, each of which produces a high alarm signal to indicate the presence of a sludge blanket at the point where they are located. An additional system fault alarm is also provided. The alarm signals can be used to provide a two stage alarm or to start and stop a pump. The correct selection of infrared sensor enables the detection of the sludge/water interface on final settlement tanks or primary tanks even when the settlement process is ‘upset’ and the interface has become disturbed. The double sensor arrangement linked to the 8200 Monitors positioned at intervals above the clarifiers allows the plant operating team to prevent the finer sludge particles entering the outlet channel. It also gives a real-time view on the SCADA system of what is actually happening in the clarification tanks. According to the plant engineer the trials revealed just how effective the sensors could be, as fine sludge particles entered the works blending chamber they would have been picked up by the turbidity monitors. In the event of the turbidity levels rising, water will block up the rapid gravity feeders further downstream and cleaning them is a costly procedure. With the plant being a fully automated site, the software supplied to work with the Partech detectors has been configured to provide a visual record of which clarifiers are de-sludging at any one time. Should there be a situation where a clarifier is constantly or too frequently de-sludging, this is indicated in the main control room. This facility enables remedial action to be taken, including visual inspection of the appropriate Soli-Tech 20 sensor by site engineers. 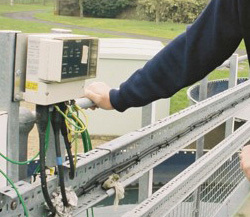 As a result of the improvements and greater plant efficiency that has been generated by the Partech systems at the smaller of the two plants, Bristol Water is now installing 12 monitor/sensor systems at its major drinking water treatment plant, where the ageing de-sludging activation system has been the subject of review for some time. Once installed and commissioned, it is expected that cost savings will follow as the clarifier plant becomes more energy efficient.